Wearing a veil at your wedding is almost as traditional as wearing a wedding dress. Over the years the amount of brides wearing veils seemed to decrease, with the increase of civil ceremonies taking place. I feel that some brides felt it was not needed. However, thanks to the recent Royal weddings veils are making a comeback, and there are some stunning ones available to buy. When I got married in a very low key style wedding almost 8 years ago, I did not have a veil, but if I was to do it all again (to the same man) I think I would do. I am very much in love with the long cathedral length veils. Although with me being only 5ft it might be a bit too long. I love the statement they make walking down the aisle, plus the photographs you could get would be fabulous. 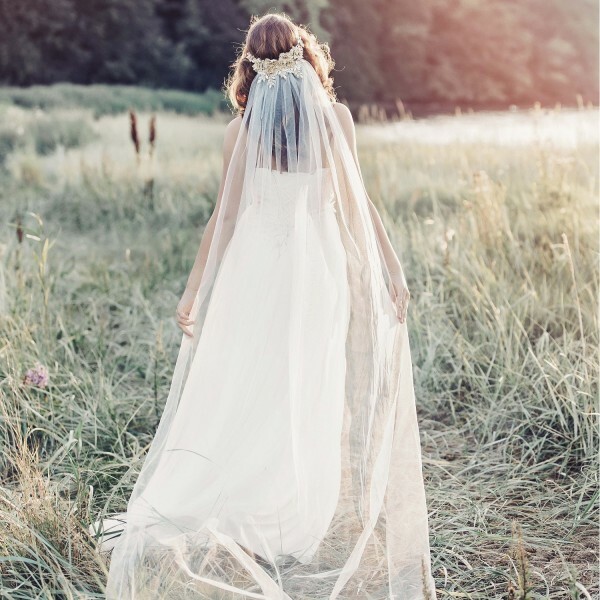 Although many of the bridal boutiques stock a range of veils, often it is very limited and brides are turning to the internet to find something that is just perfect for them. Lace and Favour is an online wedding emporium and they stock a beautiful range of wedding veils and just about every other bridal accessory. Veils come in a range of different lengths, ranging from the birdcage style all the way to the cathedral length. I have put together my top picks from Lace and Favour. Fingertip veils, are just either a single tier or a double tier veil that finished at your fingertips. They are a really popular choice with brides wanting to show off the bottom of their dresses, or to have tucked into their hair up do. Often for brides having the fingertip veils are a good choice because they are traditional yet a more modern take on a veil. 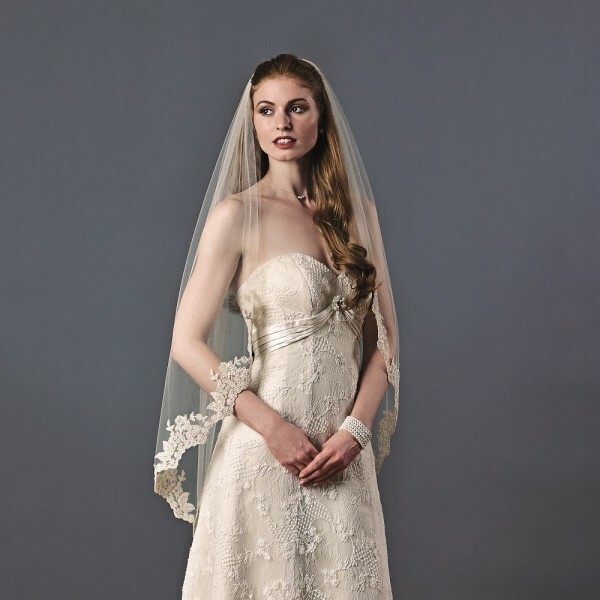 I love this Joyce Jackson Santa Anna fingertip veil which costs £139. The beautiful lace and bead edges, give it the real vintage feel, it also comes in 3 different colours. Cathedral or Chapel length veils, are my favourite ones. Finished with beautiful luxury lace, Swarovski pearls, beads some with scalloped edges. Some with built in head bands, others with a hair comb. The dramatic effect of these long veils, for me really give the wow factor. This Lunaria by Rainbow Club that costs £175 really caught my eye, I love the lace edging. It’s 96 inches so it’s lovely and long if that what you are looking for. Waist length veils, are just that bit shorter than the fingertip ones, they are a very classic yet add a splash of fun and an edgier side to your wedding look. Waist length veils are also a great option if you are wanting to wear your veil all day, as the others you may need to remove before your sit down meal because you will end up sitting on it and possibly pull it from your hair. I love the simplicity of this stunning Rainbow Club Tosca Russian braid edge waist length veil, with it’s ribbon edge, will really allow your wedding dress to do the talking. This veil costs only £49, so it’s among the best value of the veils I have chosen. 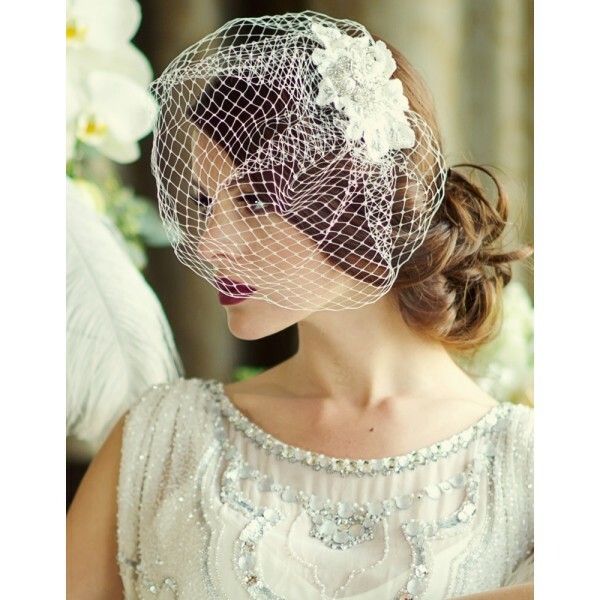 Birdcage veils, add that vintage feel to your wedding. They are often popular with more mature brides, or something looking for something a bit different. A birdcage veil is for someone that is wanting to go for something other than a classic veil. I really do like the Birdcage veils, they are different, they stand out and they look very chic. This beautiful birdcage veil by SassB Couture with crystal embellishments costs £82, with a hair clip of Swarovski crystals. 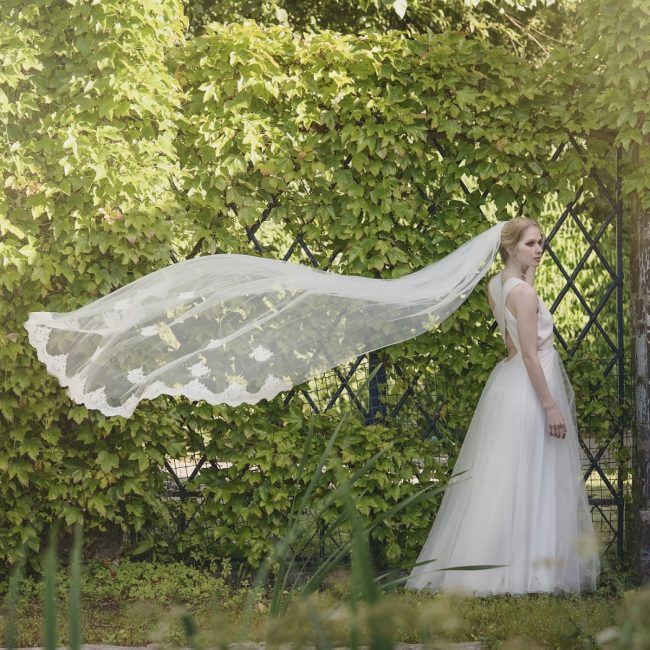 It’s a perfect little veil for someone looking for an element of couture. Full length veils are just that, they come down to the floor but do not give you any train. They are beautiful, they offer a tradition style without having to worry about people helping you to sort your train out. They come with lace, beads, pearls, Swarovski crystals, and from one tier to three tiers. If you opt for a full length veil, just make sure it covers the length of your dress, it will look odd if it finishes a few inches short of your dress. If you are not wanting a really long veil, why not try a fingertip veil. This gorgeous Gaia Bohemian floral inspired full length veil, is perfect for the bride looking for that boho feel to their wedding. It has a silk ribbon covered band, that sits like a halo with gold lace flowers. The band has flexibly so you are able to move it into place easily, it costs £259. What do you think to my selection of wedding veils from Lace and Favour? Whatever veil you go for, make your have something that suits the silhouette you are looking for. Choose a veil that suits you, your personality and also accompanies your dress perfectly. Not every bride has an endless budget for her wedding dress, so have to think outside the box when it comes to buying you gown. Second hand dresses could be a great option for you, after all they have only been worn once. Often you can find the perfect dress for you at a fraction of the price that has been previously owned by another gorgeous bride. Many selling sites are even home to warehouses of last seasons stock, so it’s always worth keeping an eye on them. I hope you find the dress of your dreams. *This is a collaborative post, all images are credited to Lace and Favour. As always thoughts and opinions are my own.